The Masked Ace's Recap and Review of "World of Sport Wrestling Season 1, Episode 2"
Show kicks off with a smirking Stu Bennett talking about how happy he is that WORLD OF SPORT finally has a champ that everyone can be proud of in Rampage. This victory inspired Stu to want to see another title match, so tonight's main event is a Triple Threat to decide the first ever WORLD OF SPORT WOMEN'S CHAMPION. Rampage and his lackeys Sha Samuels and C. J. Banks come out for a championship celebration. Like Bennett, Samuels says that WORLD OF SPORT finally has a champ to be proud of. Samuels says everyone in the back is gutless. Joe Hendry comes down to interrupt. He's on a title quest. He demands Rampage give him a title shot right now. Stu Bennett says, "Ring the bell!" WORLD OF SPORT CHAMPIONSHIP MATCH - Rampage def. Joe Hendy to retain (distraction from Samuels and Banks allowed Rampage to hit the Spike DDT). Next up is a ladder match, with the winner getting a big opportunity next week. Tag Team Tournament Match - Adam Maxted and Nathan Cruz defeated Doug Williams and HT Drake to advance in the tournament. Next week: Joe Hendry gets a shot for revenge against Martin Kirby, who betrayed him in the first episode. Gabirel Kidd's opportunity is revealed, but it is teased that it might be something awful (my money is on Crater). And more with Rampage! I want to apologize if I spelled anyone's name wrong. I made every effort to get them right, but there were a few guys I had to make my best guess on. This was just another terrific episode. Everything about WORLD OF SPORT just feels incredibly polished. The production is top of the line. The commentary does a great job putting everything in context. The in-ring action is fast paced and entertaining. Rampage plays the top heel role so perfectly, and I love the way they keep teasing that Stu Bennett and him may have some kind of agreement going on. The theme of WORLD OF SPORT seems to be something for everyone. Both shows so far had four matches, but the matches never felt rushed. And each match tonight was something vestly different. No matter what type of wrestling fan you are, there was something for you in this show. A solid title match to open the show. Then a ladder match with a bunch of high flying spots. Back to a classic "heel vs face" tag team match. And end it off with a great triple threat women's match. So far, WORLD OF SPORTS hasn't done a lot of promo segments, but they still are doing a a great job building up the stories and action through the commentary and the ring work. I also loved the mix of young wrestlers and a longtime veteran like Doug Williams. The commentators did an excellent job talking about his history, including that he had a match against Stu Bennett years ago. One of the biggest strengths for WORLD OF SPORT is that unlike the WWE or IMPACT, they don't feel like they are building up towards a PPV show. Everything feels like it has a lot more meaning. They are stll building feuds and storylines, but each episode feels important and not just a stepping stone for something bigger. I think the first season of WORLD OF SPORT is only 10 episodes or something like that, so that may be part of it. LUCHA UNDERGROUND does something similar, and I think it is a far better wrestling product for it. I did have one small complaint. The show was pre-taped, and at times it felt like the matches were edited in odd ways. There were quite a few spots where the camera cut away from the in-ring action showing the crowd instead of what was going on in the ring (like someone getting slingshotted into a ladder). The end of the tag match had the same issue, where it felt like we almost missed the end of the match because of the way it was edited. I actually prefer when a wrestling match looks more gritty, so if these edits are to "fix" the matches, it is a bad choice for me. It doesn't take away from the show in any way, but it really jumped out at me in the second episode when I didn't notice that at all in the first episode. 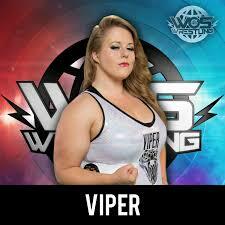 Because I close out I want to say VIPER IS A BEAST! She was just tossing her opponents around like they were toys. It was one hell of a showing! I love when you can have a wrestler lose a match, but still show themselves to be a dominant force. Two episodes in, and I am really loving WORLD OF SPORT. It feels a little early to say this, but right now it may be my favorite wrestling show. Everything just feels high energy and full of promise. The storytelling is solid, but simple where you can jump in without having to know much backstory. You get heels acting like heels, and the crowd is totally engaged. It is rare that I watch a show as soon as it airs, but I grabbed WORLD OF SPORT immediately on this Saturday afternoon. Can't wait for more!